Every once in a while, an opportunity to help out a local organization comes along and we jump at the chance to do so. We recently connected to ProKids Young Professionals (http://prokids.org/pkyp), a group founded "by professionals who wanted to help foster children but whose limited time prevented them from taking on the casework required to serve as CASAs (Court Appointed Special Advocates)." The larger ProKids organization "is a nonprofit agency that provides outstanding volunteer advocacy for abused and neglected children in Hamilton County, who - through no fault of their own - are in the child protection system." 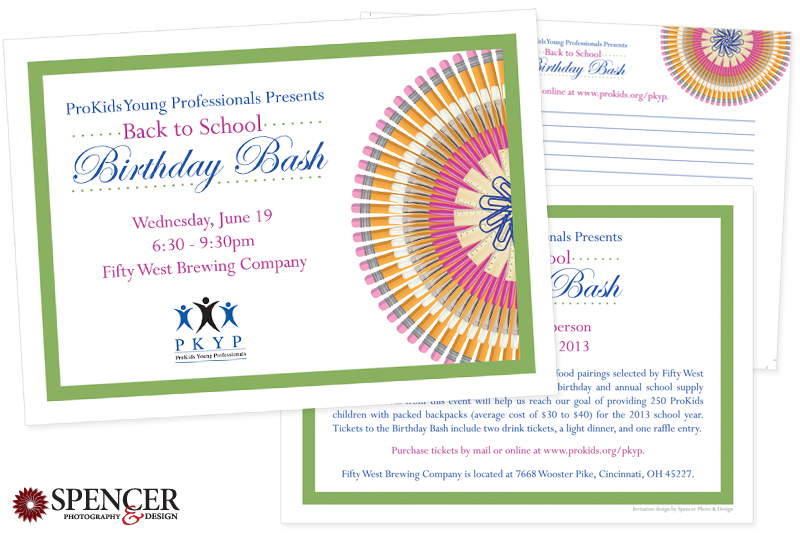 To help provide funds to ProKids (http://prokids.org), the Young Professionals group holds happy hours & fundraisers throughout the year - we were honored to help out in creating an invitation for this year's PKYP Back-to-School Birthday Bash. Proceeds from the event will help provide 250 ProKids children with packed backpacks for the 2013 school year. A worthy cause indeed! Since the theme was "back to school," the event organizers wanted something that tied in, but didn't look too elementary (pun intended!) or too stuffy. We started by creating a custom graphic from images of school supplies - pencils, paintbrushes, paperclips - it became more organic as more layers were added. We also designed the logo for the event - colorful, classy, yet fun. Together these simple design elements came together for a successful mailed piece!